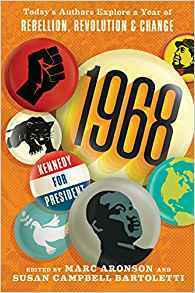 The year is 1968; Vietnam is raging, Martin Luther King, Jr. and Bobby Kennedy are shot and killed. It is a year of great changes in the world, which seem to get bigger and bigger with each day. The authors asked 14 other authors to contribute to this anthology. Each one looked at events from that year from their own perspective and viewpoints. Each view tells the story in a well thought out way, which makes the reader want to continue to read.